I still can't make anything. I have no usable craft room right now, and everything is a mess. But I'm working on other non-crafty things. This week I used contact paper on the inside of this shelf unit, which my husband and I varnished a few weeks ago. I originally wanted to paint it but that's a big commitment on a solid oak cabinet, and I could tell hubby did not like the idea. So I covered the entire inside of it, including the shelves, with white contact paper. Not bad, eh? I love vintage pyrex and jadeite. 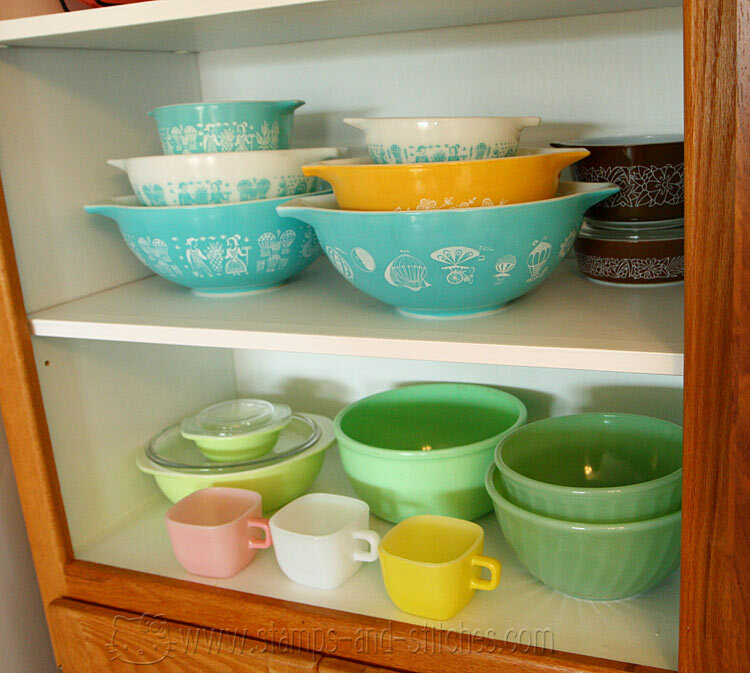 I can't afford a lot of jadeite-it's pretty expensive-so I have mostly pyrex and a little bit of other vintage stuff in here. I love the way the white sets off the colors of the dishes. My mom gave me the egg cups on the top shelf. They were packed away for years before I found them and discovered how cute they are and how perfect they go with the rest of the dishes. I don't know how old they are, but I think they're pretty old. We had them when we were kids and I'm pretty old. On the bottom shelf are some glasbake promo mugs I found at a shop. I think they were a pretty good find-I paid $6 for the three mugs and I've seen single ones go for over $10 on ebay and etsy. When I bought them I only knew that I liked them. I didn't have any idea what they were so I looked them up when I got home. I'd love to have the complete collection but I'm not paying ten bucks a mug. Now I need to find room for all of my blue ball jars. If you have or know about any blogs or blog posts that feature vintage glass, please share them in the comments. I'd love to take a look. ooooo beautiful!!! what an awesome collection and way to showcase it. oh i love your display cabinet! very pretty- love al the pastel shades! 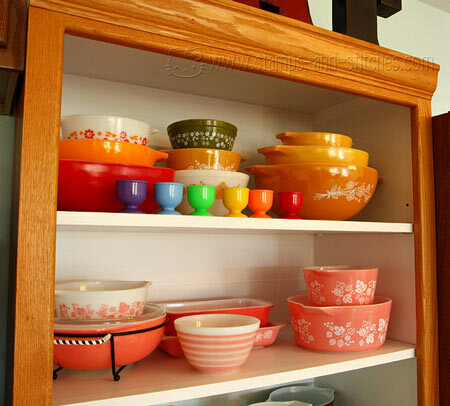 Gayle, I know Jeni of In Color Order collects pyrex. I tried really quickly to find a post of hers with the pyrex, but couldn't find one. 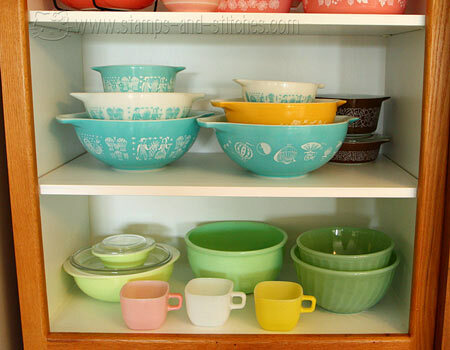 Gayle, What a beautiful display/collection of Pyrex and Jadite. 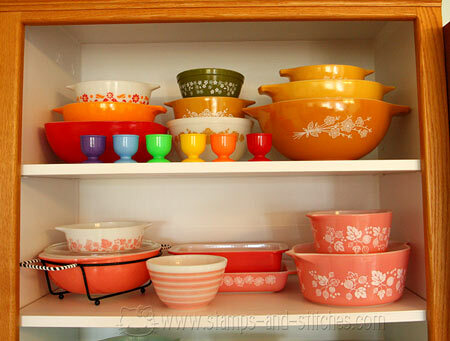 I love the peach colored Pyrex. I've not seen that before. WOW! What a wonderful collection of pyrex and love it up against the white background! It really stands out beautifully. Great collection...I just started mine. I have a really dumb question and feel really stupid asking, but how do you get the levels inside the pieces so they all show? I guess I mean what do you put into the bowls and casseroles to elevate them so you can see all the nesting pieces. Like I said, dumb question but I would like to do the same for my few pieces! I am in love with your Pyrex!!! It looks fabulous against the white background, what a smart idea to use contact paper. I just did a Google search of "Pyrex blog" and loads of sites popped up, bet you could find what you're looking for that way. Thanks for sharing the beauty with us, saw your link at Sew Many Ways. They are displayed so lovely. You have a beautiful collection. Visiting from Sew Many Ways. Wow! Wow wow wow WOW! How did I miss this?! Your dishes and cabinet are super cute.